HARLEM — Jonathan Franco thinks his experience makes him the best bartender uptown. "Knowing the history behind the drinks is important. You have to know the basics," said Franco, 24, who tends bar at La Bodega 47 on Lenox Avenue and 118th Street and has been keeping bar since he was 18 years old. But Bryan Yabroudy, the bartender at Cove Lounge on Lenox Avenue and 126th Street, contends that his personality makes him the best. "I'm quick, passionate and very creative," said Yabroudy, 32. "I love sharing my ideas, and I love joking with my customers." Franco and Yarboudy will be among 12 bartenders vying to be crowned Uptown's best bartender Monday night at Harlem Tavern in the Uptown Battle of the Bars. The competitors were whittled down from 28 when the public voted on the drink-slingers' original cocktails. One of Franco's entries is called the Cane Tart, which is made with Hennessy, sugar cane juice, fresh lemon, bitters and chai tea syrup. "It's like having an iced chai tea," Franco said. "It's very refreshing." Yabroudy created the Garden of Eden, which includes Hendricks Gin, maraschino liqueur, crème de violette, agave, muddled fresh kiwi and basil. "It tastes like spring — sweet and earthy," Yabroudy said of his recipe, which is based on a classic cocktail called the Aviator. The final bartenders from establishments in Washington Heights and Central and West Harlem will compete in three rounds. 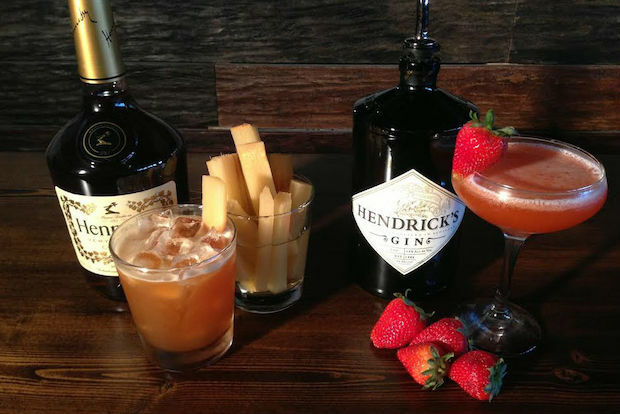 In the first two, they will make cocktails from the contest sponsors, Hennessy and Hendricks Gin. In the final round, they will have to concoct a cocktail on the spot using surprise ingredients. Nikoa Evans-Hendricks — executive director of Harlem Park to Park, which organized the event with Karl Franz, owner of Harlem speakeasy 67 Orange and Good Ice Marketing — said the number of people who voted on this year's cocktails increased dramatically, showing how Uptown's bar scene is growing. "People are now coming to Harlem and expecting a cocktail with a certain level of sophistication," she said. The competition is also becoming a launchpad for local bartenders. Last year's winner, Naima Williams of W XYZ Bar at the Aloft Harlem Hotel, has moved on from her job there and is now helping establishments develop cocktail menus. "She has done very well since the competition. People now know who she is," Evans-Hendricks said. "We hope this year's competition can provide the same opportunities." While Franco sees his future in the world of fashion design, Yabroudy has already done some drink consulting and is hoping to expand in that area with a victory. "People are paying to enjoy themselves and you can create something that can make them happy," he said. "That's what this business is all about." Tickets to tonight's showdown at Harlem Tavern, 2153 Frederick Douglass Blvd. at purchased Street, may be purchased online for $35 or $40 at the door. Attendees will receive drink and appetizer specials and be able to sample the original cocktails.